Malka Marom’s latest book “Joni Mitchell – In Her Own Words” details the intimate interviews she had with Canadian painter/songwriter and artist Joni Mitchell over the decades. Joni Mitchell, known to stay away from the media spotlight, talks freely and openly about herself in Marom’s interviews. It is Marom’s gentle inquisitive style of questioning that draws the story out from her guests making them feel comfortable to share their inner thoughts and feelings with her. Marom’s career included being a host of CBC’s weekly show “Song Of Our People” and also City TV’s weekly show “Mosaic”. Her debut novel “Sulha” was loosely written about her experience living in the tents of the Bedouin people of Sinai. She also produced “The Bedouins”, a film documentary which won the Ohio State Award. 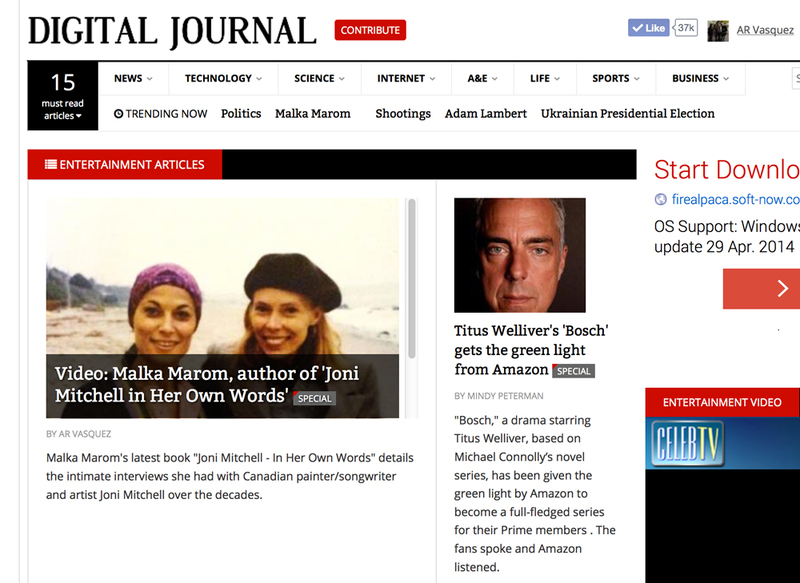 Digital Journal via Fiction Frenzy TV VLog Channel had the opportunity to interview Ms. Marom about her debut novel “Sulha” and her latest book “Joni Mitchell – In Her Own Words”. She talks about her first chance encounter with Joni Mitchell in a dark cafe in Yorkville one dark stormy night. Malka Marom is dressed in the Bedouin attire while staying as a guest in the Bedouin women’s tents. Marom speaks about her life experiences with passion and honesty sprinkled with a sweet sense of humour. When asked about her alleged relationship with singer/songwriter Bob Dylan, Marom explains about how she was first introduced to him backstage at Madison Square Garden. When asked, she reveals a special surprise about her friendship with Leonard Cohen.